My Vijaya greetings to all of you! Trust by the grace of Divine Mother, the Durga Puja or Navaratri at your place, as usual, would have been a spiritually stimulating and enjoyable experience. Here of course, Mother made me travel (felt blessed) all the centres in Northern Natal. I left HQ on the very first evening of Navaratri for Talks at Asherville where Sri Sarada Devi Ashram is situated. The vibrant atmosphere there enlivened my Talks on Durga and Her manifold Names. Next day I reached Newcastle for the noon lunch. The Navaratri second night was spent there. The program there included Puja, bhajans and my Talks. ‘Mahakali – Her Aspects’ was my pet theme that I dwelt upon. After supper, the devotees of Newcastle sat with me when we had lively discussion on religious life. Next day individual appointments were granted to devotees from morning 8 to 11. My third night stay was at Dundee. The program at the Dundee shrine which is indeed so beautiful was in the set pattern including my Talks. Here I took up the subject of ‘Grace of Kali’. Next day again from morning 8 to 11 devotees of Dundee met me in groups and we had lively discussion on interesting subjects. 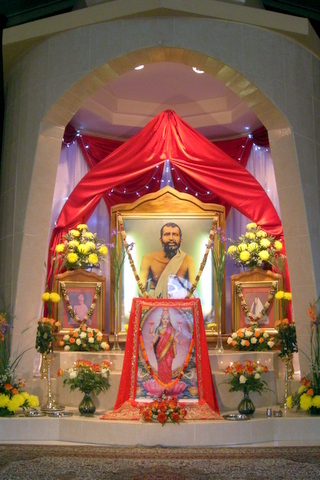 Albeit tucked away from the mainstream land, living as if in a seclusion, the devotees of Holy Trio have undeniably kept up the spirit of love and service. The keen interest that the growing children of Dundee devotees took during discussions eminently suggested to me that they are really ‘thirsty’ for the right kind of knowledge about Hinduism. I reached Glencoe by noon. My thinking that I would have a quiet lunch was taken a back seat when I found that old devoted lady had invited almost all the devotees of Glencoe! 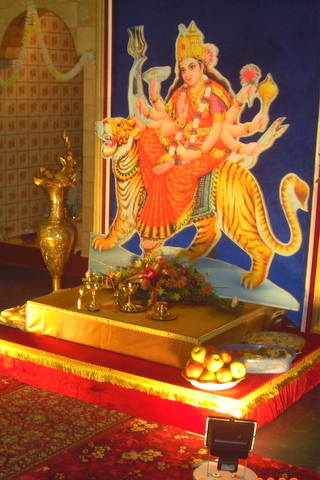 The evening program was held at the only Hindu Temple wherein a big cut-out of Devi Amba was kept in front of the presiding five deities – Ganesha, Shiva, Murugan, Vishnu, Ram. 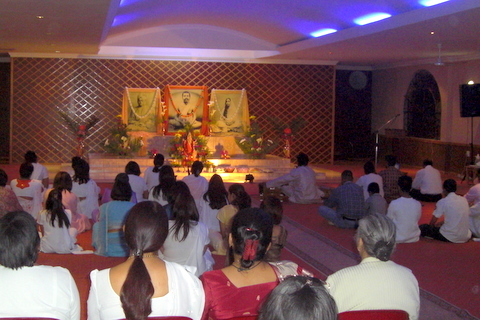 Here also the usual satsang pattern was adopted that included my Talks on ‘Three Functions of Energy’. The children and devotees of Glencoe were always fascinating to me as their faces would instantly light up with devotion unbelievably. The post supper discussion went on and on till we realised that the time was fifteen minutes to one in the night and I rose for the rest! Next day from morning 8 to 11 the devotees and their children from Glencoe as well as Dundee assembled. The discussion continued till I got ready for departure for Ladysmith. They saw me off; and the parting was indeed so heart-rending especially when the children could not contain their tears! Reached Ladysmith for the lunch. Selected devotees were there who all joined me in the sumptuous lunch that was served lovingly to all of us. Post-afternoon rest, I was taken to Ladysmith Centre where a strikingly enchanting shrine is there. Here also the usual pattern of satsang was followed with my Talks juxtaposed in between the items of program on the fifth night. ‘Mother’s Protection’ was the theme I chose to deal with. 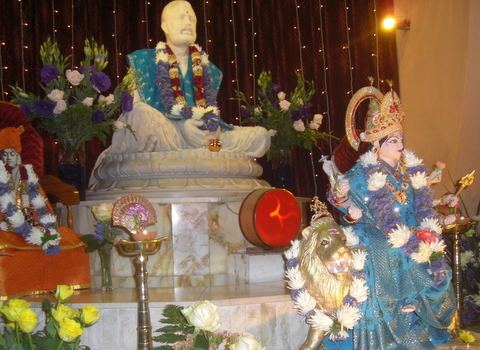 About 250 devotees who attended were served with supper in the nearby Civic Hall. Next day morning I went to the Centre where the Sunday School for children was in progress. I met all the different class students from kids level to adult level. I felt satisfied in witnessing the loving efforts put up by the voluntary teachers in imparting the cherished Hindu values through study of religious books. 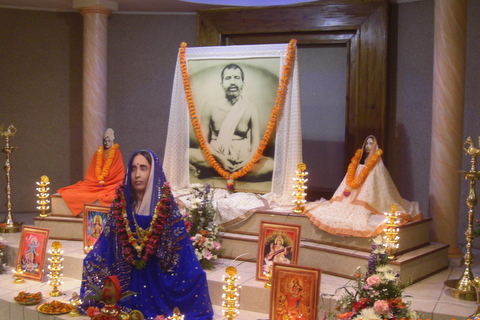 My Salutations and Prostrations to Master, Mother and Swamiji. Happy Belated Birthday Swamiji !!! May Mother bless you and grant you good health and happiness. It was a great pleasure just being in your presence and listening to your beautiful talks during Navarathri . Swamiji I am a bit confused about a certain aspect about Navarathri. I was told that the first three days were dedicated to Mother Kali, the second three days are dedicated to Mother Luxmi and the last three days are dedicated to Mother Saraswathi. To my knowledge Mother Luxmi and Mother Saraswathi are Mother Kali’s daughters. I was also told that Navarathri is dedicated to the nine different forms of Mother Durga.I am now very confused Swamiji.